Al Campeggio Le Tedey di Le Moutchic (Gironda), soggiorni a soli €18,- a notte in bassa stagione grazie alla CampingCard ACSI. In una delle 700 piazzole itineranti del campeggio nel periodo 27-04-2019 - 22-06-2019 e 07-09-2019 - 21-09-2019 a tariffa ridotta. Oltre ad offrire prezzi vantaggiosi ai titolari della CampingCard ACSI, il campeggio accetta anche l'ACSI Club ID (sostitutivo del documento di identità). Questa struttura offre relax e natura sotto una pineta di oltre 14 ettari. 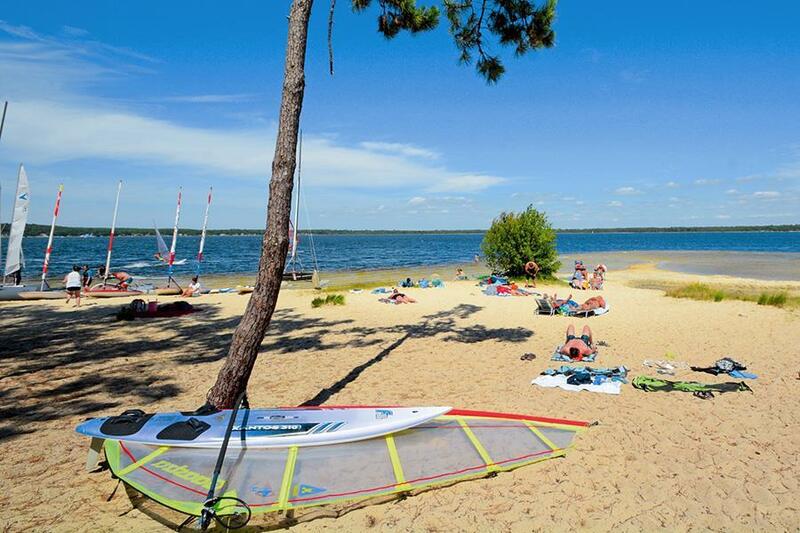 Accesso privato alle spiagge del lago Lacanau, ottimo per famiglie, bambini e per tanti sport acquatici. Dotato di ogni possibile attrezzatura per il tempo libero. In bici si raggiungono presto le spiagge sull'oceano (7½ km). Loved this campsite and ended up staying a bit longer than we originally thought, the reason being that the road cycling around the area was fab. Lots of quiet roads at this time of year and many off-road trails too. The forest run to Hourtin Plague was lovely, just the odd car and miles of lovely tarmac. The ride to the Lacanau-Ocean was lovely, wished we\'d taken our swimwear with us as it was beautiful weather. Plenty of room on the campsite, the toilet block was ok except for no toilet paper - just an annoyance for us ladies when we forget. There is a shop on the site which has a good supply and where you can buy bread. The little beach looked ok but we didn\'t try the bar. Overall a lovely site even though we did get dripped on a little bit by pine gum!! Peaceful site in beautiful forest with red squirrel. Plenty of shade. The beach and the lake were safe, lovely, great for children. Wash block is fine, water hot. A bit out of town but that was an advantage, and there is a small shop on site. A very large and surprisingly empty site given the pleasant location next to the lake. The pitches are beneath trees and are of good size. The toilets are immaculate and kept spotlessly clean. All of the staff we met were very friendly. We found the WiFi to be excellent. The site shop was stocked and open. There are many good cycle paths in this area. We would have liked a lakeside pitch, but at the moment, they do not have electricity. Hopefully this will happen before our next visit. Campsite in a beautiful setting. Easy cycling to beach along cycle routes. We could not choose our pitch and were rather jammed in with other people, even though the site wasn't that busy. No toilet paper provided. Lots of very hot water but no cold water for brushing teeth. From your review I expected to find the camping site spectacular. The reality was that it was really quite ordinary. The fact that it is located within a forest means that to drive to your emplacement you must negotiate trees in every position possible making access with the caravan very difficult. The pitches are in all shapes and sizes and the ground surface is like the forest floor - very dirty. Access to the lakeside is possible by car but much simpler by bicycle or on foot. Then there are the clouds of flies-in their thousands. Don't think I've finished yet. The forest is made up of 30 meter tall pine trees in which live squirrels that are constantly dropping half eaten green pine cones on you and your car/caravan and awning. The half eaten cones are dripping with resin that sticks like superglue to everything and cannot be washed off without the use of solvents. Many campers layed wooden crates on their roofs to prevent damage from these missiles. I shall not return here again. Volete prenotare il campeggio Campeggio Le Tedey o oppure saperne di più? Potete farlo usando i seguenti dati oppure tramite il sito del campeggio. Da Lacanau verso Lacanau-Océan, D6 direz. Le Moutchic. Seguire la strada fino alla fine di Le Moutchic e alla fine del lago, poi girare a sinistra. Seguire i cartelli. CampingCard ACSI invia la tua richiesta di informazioni al "Campeggio Le Tedey".